Leonardo designed several flying machines in Manuscript B. Since he took inspiration from nature, he knew he had to study animals that fly in order to discover their secrets. He came up with dozens of mechanisms and systems that imitate the flight of birds, bats and certain insects. All these devices are found throughout Manuscript B following a logical sequence. 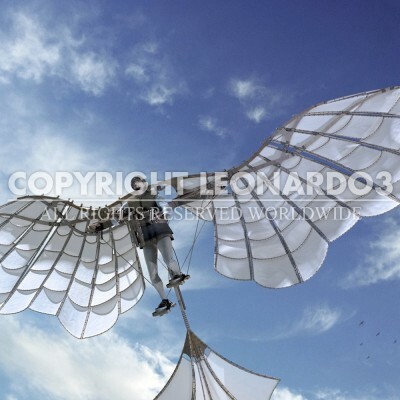 Leonardo understood that it wouldn’t be possible to cover the framework of an artificial wing with a single piece of cloth. Machines built this way present a problem. When the wings come up during flapping, air resistance presses the machine downwards. The solution to this problem can be found by observing the king of birds: the eagle. Its feathers contain the secret to its flight, so we have to imitate how they work by recreating their characteristics mechanically. This flying machine – one of the most complex ever designed – has been reconstructed for the first time in 500 years, in imitation of the elegance and flying technique of eagles. The framework has been reduced to the bare minimum with a weight of no more than 175 pounds. A pulley system is used to make the wings fold, flap and turn. The little wing flaps imitate the eagle’s feathers by allowing air to pass through on the up-stroke and closing on the down-stroke. The pilot’s head movements control the tail through a headband. However, a human being cannot flap the wings fast enough to fly. What makes this machine impossible to use successfully is therefore related to the amount of energy needed and not how it works.